alaTest heeft 1275 reviews verzameld en geanalyseerd voor Logitech Tablet Keyboard for iPad. De gemiddelde beoordeling voor dit product is 4.3/5, vergeleken met een gemiddelde beoordeling van 4.2/5 voor andere producten in dezelfde categorie. Gebruikers waarderen het gebruiksgemak zeer. Consumenten beoordelen dit product gemiddeld met 87/100 en experts beoordelen dit product gemiddeld met 77/100. The ; for the iPad has a sturdy feel, iPad-specific control buttons, and its magnetic slipcover doubles as an iPad stand when typing, tilting to multiple angles. The full-size keyboard's not as portable as a keyboard case solution. The plastic chassis feels a bit creaky on the edges, and the stand uses a fragile flip-out plastic piece. Some might prefer Apple's keyboard instead. If you frequently use your iPad for writing or emailing, a Bluetooth keyboard is a must-have accessory, and the the Logitech Tablet Keyboard is a good option, but it doesn't offer any unique or special functionality. Very comfortable full-size QWERTY keyboard. Lots of iPad-specific keys. Carrying case doubles as stand for iPad. Easy to connect. Heavy. Doesn't double as an iPad cover like many other add-on keyboard options. The iPad works well for web surfing and its onscreen keyboard is accurate and large enough for some fairly lengthy emailing, but sitting hunched over it while jabbing away at a touchscreen is hardly good for your fingers or back. The Logitech Tablet Keyboard For iPad is an affordable and well-built device, but it's heavy and doesn't dock with the iPad as some others do. The Keyboard Tablet is well designed, but its shortcomings demonstrate that if you want to put a device on top of your lap there are better devices for that. While it's technically possible to write on an iPad, for most people, laptops are still the mission-critical writing machine of choice. It's all about the keyboard: a virtual keyboard simply can't cut it. The Logitech Tablet Keyboard for the iPad has a sturdy feel, iPad-specific control buttons, and its magnetic slipcover doubles as an iPad stand when typing, tilting to multiple angles. 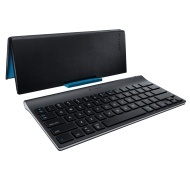 The Logitech Tablet Keyboard for iPad is a stand alone keyboard with a case that doubles as an iPad stand. Logitech also sells a version of the Tablet Keyboard for Android tablets. It is identical to the iPad version, with the exception of the Android-specific function keys on the top row.